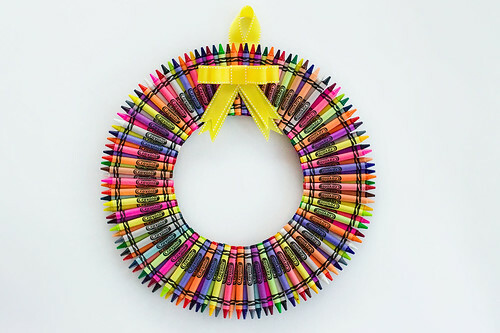 I made this crayon wreath for dd1's teacher (jk/sk) for in the classroom for Christmas (plus a Starbucks gift card of course ). I'm really pleased with how it turned out. I love all things bright and colourful. I'm tempted to keep it myself. I hope she likes it. I can't take credit for the idea..... Inspiration came from Pinterest. Last edited by Erica; 12-22-2011 at 08:48 AM. what a fantastic idea and gift! what an awesome idea! I might steal it for the end of year gift! Formerly "lila's mum" but I had outgrown that name, now that I have 3 beauties. I love those wreaths! I am planning on making one for each of my kids teachers for their year end gift. that's awesome! what a great gift. I hate one of my boys teachers this year - would it be especially bad if I only gave gifts to the two teachers I like? Like this woman has made school hell for two of my children and now she's working on number three... I don't want her to get the impression that I appreciate her. gogo- Give gifts to whoever YOU want to give them to. Sounds like this teacher already knows you don't care for her?? I'd just give her a card from your dc. I love it, think I'm going to have to check out this pintrest site. I've heard of it, but seems to have some fun new ideas. So cute! I saw that on pinterest too! I love pintrest! So many great ideas! I saw those on pinterest too they are really cute! By mountain mama in forum General Support/Advice about the Kids! Do you get your child's teacher a gift? What?